Standard reply to Mr Tadlock...email forwarded to MCHC members and others interested in MC history. After further research, I learned that he gave his life for the Confederacy on 8 Nov. 1863 in Arkansas. northeast corner of the cemetery marking the foundation of the Baptist Church". this information post dates that. typed (see Attachment #1 ). considerable distance downstream from the same. where he found them. God bless him!. I'm sorry that I was unable to answer your inquiry, but hopefully I'll get at least a "C+" for effort. Take care and thank you for giving me a shot at this anyway!. I accidentally found another article related to your earlier inquiry. 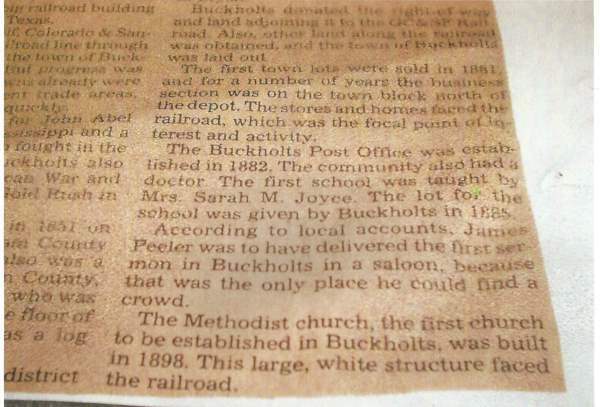 Charles King, the Past Director of the Milam County Museum, used to write historical articles for the local newspapers. The references for these articles are filed in the museum. Later he compiled them into a 3 volume set that are for sale at the museum. The above article is from Volume III of Tales of the Museum. The book has no page numbers. Again, this Church post-dates the Civil War. There are/ were other communities along the banks of Sandy Creek per Charles Hubert, a local historian. The historical documents that I've been able to uncover in the Sandy Creek Community/Big Lump (proper) make no mention of this earlier Church. The Jose Leal Grant mentioned (attachment #2) is a large 6 League (approx. 26,570.4 acres) survey filed Oct. 26th, 1833. You will note that it is bounded by Cameron to the north, Rockdale to the west and Milano to the east. Sandy Creek would be located approximately 1/2 the distance to the east from Rockdale to Milano and in line with the International and Great Northern Railroad running east and west as seen. 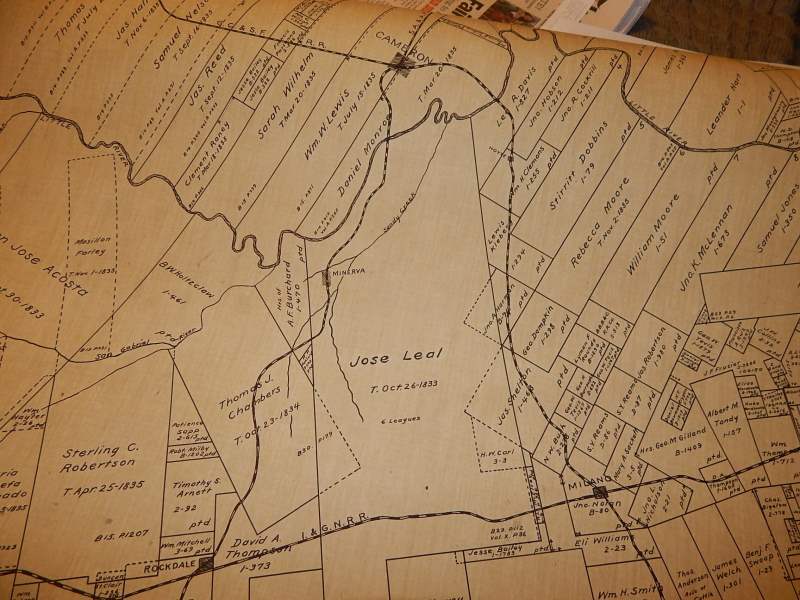 This photo is from a 1918 General Land Office map (GLO). Would you be kind enough to share your reference source with me?. I would like to discuss this with Mr. Hubert and see where we might reference search along Sandy Creek. The article from which I learned of the log Church was written by John Bodkin Link in the Texas Historical and Biographical Magazine. The article is from 1892, and is on Rev. John Runnels Briscoe, who served in a Confederate cavalry regiment which I am researching. "One of his [Briscoe's] appointments was in Col. Gideon Smith's house. The Colonel, his brother, Dr. J. C. Smith, and his brother-in-law, Allen Agnew, all extensive farmers for that day, had a set of blacksmith tools, and when Briscoe came to his monthly appointments he would remain over a week and do all the work they needed in that line. He organized a Church in their community and called it Sandy Creek; and as they had no house, he told the brethren that if they would have the cedar logs cut he would hew them, and they would build a Baptist church. The logs were cut, he hewed them, the house 40x28 was built, and for many years that was the strongest church in the Sister Grove Association. The house still stands, is as good as new, and a small church still worships there. The Sister Grove Association was organized on three churches, numbering ninety-two members, June, 1853, and Briscoe was their first missionary." I hope the few details given here might help to narrow the search a little. If not, I will be glad to do what I can to help. Thank you so much for getting back to me. What an excellent article, and I would certainly" take it to the bank" for accuracy. If I may be the devil's advocate for a moment, do you have supporting documentation of this being in Milam County? I believe that we're to assume that the community had no name and it was named Sandy Creek after the Church was organized?. How about the unnamed community already having a name, but calling the Church Sandy Creek?. One would think that if that was the case, he would have written "and called it the Sandy Creek Baptist Church". I'm only questioning that we have the church geographically placed in the correct location so that we're researching that same general location. Obviously your research has been far more inclusive than mine and I need you to bring me up to speed so that I may help contribute to your effort. I believe that the Lucy Hill Patterson Library in Rockdale has a book on early Milam County pioneers and I'd like to see if it places Col. Smith, Dr. Smith and Mr. Agnew in the same. Note: I am cc'ing this to my dear friend Mr. Charles Hubert who quite possibly is the most knowledgeable person in Milam County regarding the Sandy Creek community and its history. RE: Rev. John Runnels Briscoe, Col. Gideon Smith, Dr. J. C. Smith and Allen Agnew. 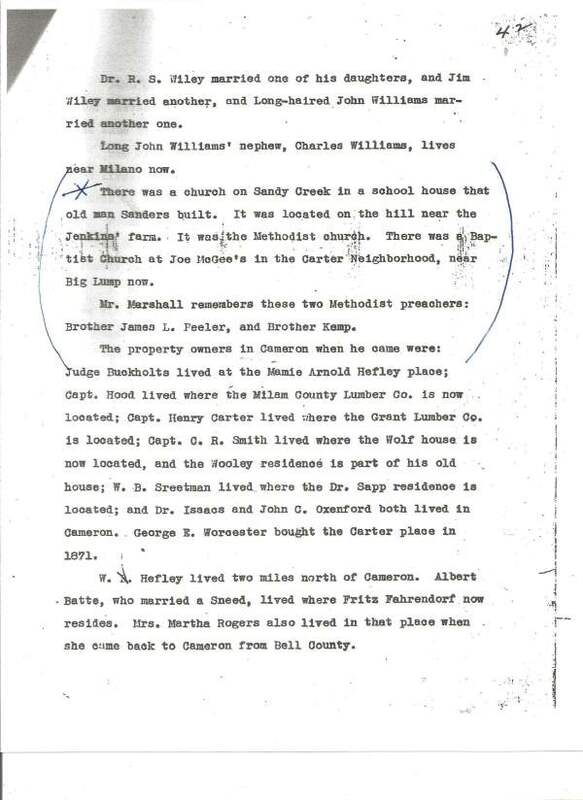 Easy Search for Milam Ancestors, transcribed by Dorothy Brown Crawford. I located your John Runnels Briscoe in the Confederate State Roster, Vol I pg. 58 and Vol II pg. 120. Do you know if the Runnels, in John Runnels Briscoe somehow traced ancestry to Hardin R. Runnels, Gov. of Texas(1857-1859), in some convoluted way?. It just seems like a rather unusual name to be tossed around.